Atletico Madrid boss Diego Simeone has defended the decision to go ahead with Sunday’s 2-0 win over Deportivo La Coruna as he claims the club were unaware of the tragic violence going on outside the Vicente Calderon. It was confirmed after the 2-0 win – in which goals from Saul and Arda Turan allowed the reigning champions to close the gap at the top of La Liga to four points – that a man had died after clashes between fans of the two Spanish teams. 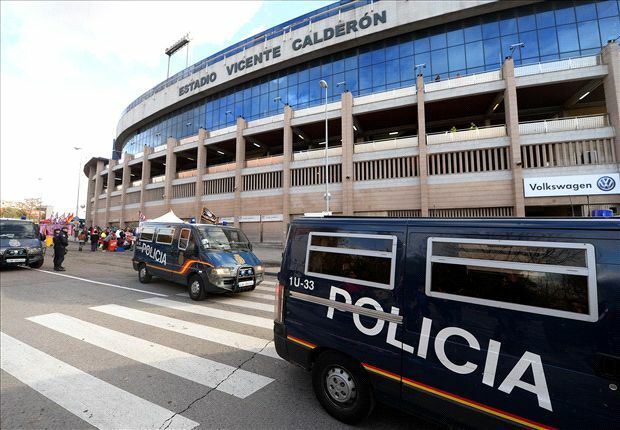 The Liga de Futbol Profesional (LFP), which runs the Primera Division, claimed they tried to get the match cancelled due to the violence but to no avail. However, the thought to cancel the league game never crossed Simeone’s mind as he insists he was not informed of the severity of the situation in Madrid. “I speak sincerely, I was not aware. I listened to people, but was not clear what was happening,” the Argentine coach told reporters. “I am hurt by the situation we are living with. I do not have any arguments as to why it happened. We are sad – this sort of thing has nothing to do with football and hopefully it’s not repeated. Atletico president Enrique Cerezo, meanwhile, saught to distance his own club and Deportivo from the violence, condemning the “radical groups” from dragging the game through the dirt with their actions. “I would like to say these facts have nothing to do with football,” he told reporters after the match. “They are radical groups, they meet and generate these consequences. “Deportivo chairman and myself have nothing to do with the facts. We preach peace and harmony among the teams. We have said this long time ago. We come here to enjoy, not to have this consequences. “We can’t anticipate the facts because we unknown them and are under investigation. I repeat Deportivo and Atletico have nothing to do with these facts.